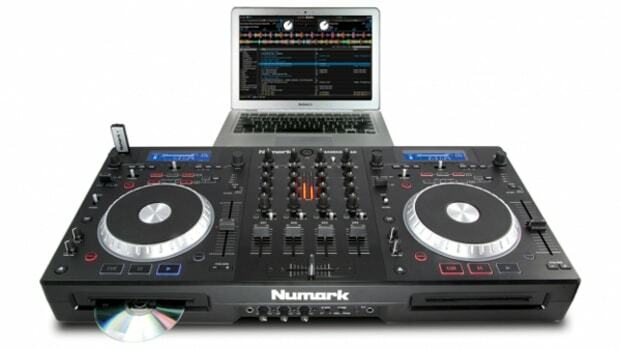 The Numark Mixdeck Quad is a new DJ station that can do many different things all at the same time. 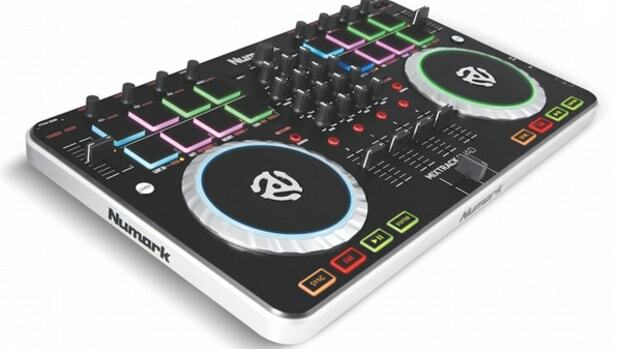 The Mixdeck Quad is like having two full-featured Numark NDX-900 multi-media players attached to a Numark mixer all neatly integrated into one versatile unit that can also double as a DJ controller when connected to a computer or an iPad. Check out my full HD-Video and written reviews after the jump. The Numark Mixdeck Quad is a new DJ station that can do many different things all at the same time. 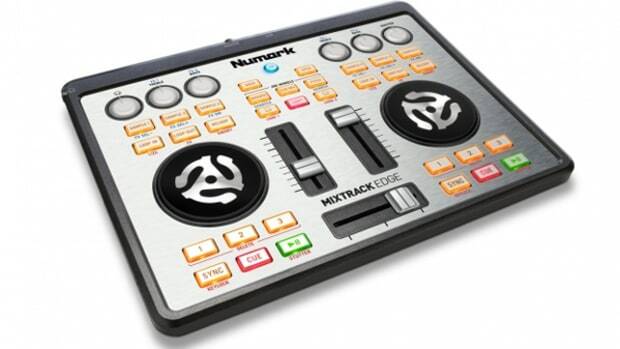 The Mixdeck Quad is like having two full-featured Numark NDX-900 multi-media players attached to a Numark mixer all neatly integrated into one versatile unit that can also double as a DJ controller when connected to a computer or an iPad. 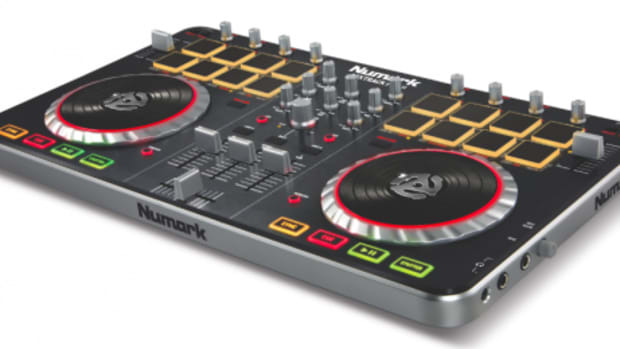 The overall impressions of the Numark Mixdeck Quad are generally good. The unit is made up of mostly plastic and all of the faders, knobs, and jog wheels have a little give to them but nothing that would hinder the unit during actual use. The Mixdeck Quad feels like the same quality of the Numark N4 and everything has a vrey logical layout for a four-channel and four-deck setup. The unit as a whole is rather big and it won’t fit inside of any laptop bags, but the plastic weight does end up saving a few pounds for easy transport. The Mixdeck Quad comes bundled with Serato DJ Intro that can turn the Mixdeck Quad into a two-deck DJ controller when connected to a computer. The setup of the system is rather easy when using it for stand-alone playback without a computer since all you have to do is plug in the power cord, speakers, and insert the USB drive or CD into the CD slots and you’re ready to play. If you want to use it as a DJ controller, then the Mixdeck Quad must be connected to a computer via the supplied USB cable and the Serato DJ Intro software must be installed on the computer. Then simply switch the Decks over to MIDI/USB mode and those channels will work with Serato DJ Intro. The Mixdeck Quad has two separate decks built right into the workstation that are located on the left and right sides of the mixing portion of the unit. Each of these full-featured decks has its very own dedicated set of RCA outputs that can be connected to another mixer or any other device for playback. The decks can essentially be used independently of the mixing portion of the Mixdeck Quad if a DJ wishes to do so. Each Deck has a CD slot that can play MP3 or Music CD’s and a USB slot for music file playback. Each deck has an easy-to-read LED screen with the track information, Loop, Hot Cue, Samples, effects, and the navigation options all clearly visible. These screens also show track playback information when using the unit in MIDI mode on Serato DJ Intro. There is an oversized Track knob and back button for file navigation. Each deck has very tight Jog Wheel integration with the CD playback, USB drive playback, and with the Serato DJ Intro Software. Each time we used the jog wheels, they just felt right! They were high resolution and they were always a perfect one-to-one operation with virtually no latency issues at all. These are great jog wheels for scratching or any other style of playback. The touch-sensitive jog wheels also have a separate start and stop time adjustment knob that correspond to the Play and Pause button. It’s worth pointing out that the Play and Pause buttons are separate on each deck and it took me lots of time to get used to this as most other controllers/players have the play and pause button combined. Each deck has a Reverse/BLEEP knob that allows the DJ to play the track back in Reverse or in the BLEEP effect (which lets the DJ alter the playback of the track when activated but returns to its normal position track time when released). Each deck has (6) Beat-synced DSP effects with wet-dry fader (chop, echo, filter, flanger, pan, phaser), 2 Loops, 3 Sample banks, and three Hot Cues. The Pitch sliders are very long and they can be switched between ranges 100%, 25%, 12%, and 6%. There are Pitch Bend buttons as well and it was generally good at riding the pitch for accurate mixing. Both Decks can share and access the same USB drive music for simultaneous playback. Another worthy note for any potential buyers or users is that each deck cannot be layered to handle multiple assignments simultaneously meaning that if you are using the left side deck for Serato DJ Intro, then you can’t start using the same left side deck’s CD slot in the background without stopping playback. The mixing portion of the Numark Mixdeck Quad is very similar to what is found on the Numark N4 that we reviewed a few weeks ago. The Mixdeck Quad has a nice crossfader that was pretty adequate for scratching as well as mixing both in Serato DJ Intro and while using CD/USB playback. The Channel faders have slightly more resistance to them than the crossfader and they feel like they will get the job done. There is a curve control switch on the front as well as another switch for crossfader reverse control. Also on the front of the unit is the Microphone 1 quarter-inch Input with Gain and EQ controls along with the MINI and quarter-inch Headphone Outputs. The Microphone 2 quarter-inch/XLR combo Input is located at the top center of the unit. The Mixdeck Quad only has Master Level UV meters on the mixing console which means that the user doesn’t really have a way to know the level of the music in each individual channel when looking at the workstation. Each Channel has its own Cue Button, Crossfader assign toggle switch (to change the side of the crossfader that the channel resides on), a 3-Band traditional EQ (without Full-Kill), Gain knobs, and an input switch. The input switch at the top of each channel is used to change each of the four channels into either an on-board deck, a mixer input deck, or a MIDI USB (Virtual Serato DJ Intro) Deck. Channel one can be selected to work as Deck1, MIC2, or MIDI. Channel two can be selected to work as Deck1, AUX1 (input on the back), or MIDI. Channel three can be selected to work as Deck2, AUX2 (input on the back), or MIDI. Channel four can be selected to work as Deck2, AUX3 (iOS device), or MIDI. 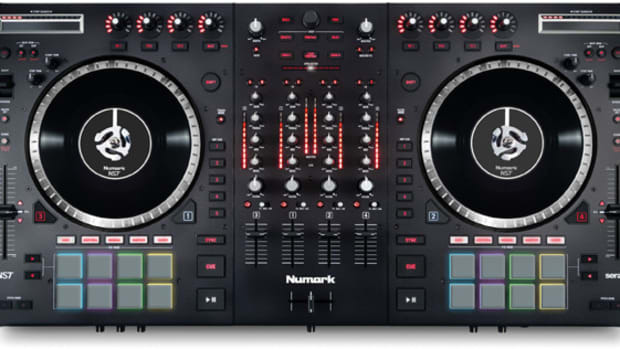 Please note that the Numark Mixdeck Quad can only be used with all four channels/decks when there are two external decks plugged into the device. You cannot use a hybrid of two Virtual Decks and two on-board decks simultaneously as the decks themselves have no way of being layered. They are either one type of deck or the other at a particular time. In order to switch a Deck back and forth from MIDI mode to USB/CD mode, the user must press the source button which essentially stops all previous playback. The Numark Mixdeck Quad is a MIDI controller and can be mapped to Traktor or VDJ, but I decided to test the unit only with what was supplied (I did not see Traktor or VDJ mapping file on the Numark website at the time of writing this review). There are lots of ways to connect the Mixdeck Quad to the outside world. In the output category, there are Balanced XLR outputs, RCA outputs, Booth RCA output, and Record RCA output. There are separate knobs to control the volume of the Booth and Master levels on the top-front of the unit. There are two AUX/PHONO inputs (Aux1 and Aux2) and each Deck has its very own RCA output meaning that you can use the Decks independently of the actual Mixdeck Quad Mixing console. There is also a second Microphone input in the top-middle of the unit which can be controlled by the EQ’s and controls of Channel 1 when the source is set appropriately. There is a USB connection on the back for computer/MIDI playback. There is also a dedicated AUX 3 or iOS Audio connection to connect to iOS devices. Any iPod or iPhone can connect to this device for audio file playback, but if you have an iPad you can actually dive a bit further into the MIDI control of this device. I did not test this feature during this review. In Conclusion, the Numark Mixdeck Quad is a really full-featured machine. The device is capable of so many different playback options while the mixer OR the decks can be used as stand-alone devices as well. Users can playback CD’s, USB device audio files, MIDI computer playback with Serato DJ Intro, and the iPad can also work in conjunction with the Mixdeck Quad. The Jog wheels have high resolution in any playback mode and there are lots of inputs and outputs to play with. To top it all off each individual deck has a full feature set which consists of effects, hot cues, samples, two loops, reverse, and Bleep. There were only two minor gripes that I could find with the unit. The first is that the Mixdeck Quad is made of mostly plastic and it makes the unit feel more directed at beginner to intermediate user levels. The other gripe is that there are only Master level UV meters to show the level of the overall mix. There is no way to see the individual levels of each line when in use. Other than these minor issues, the Mixdeck Quad is a pretty solid performer. I recommend the unit to DJ’s who need the option of playing CD’s and USB drives while also being able to plug in additional decks or a computer for MIDI playback. This is also recommended for Mobile DJ’s who play many different types of formats for all types of occasions. 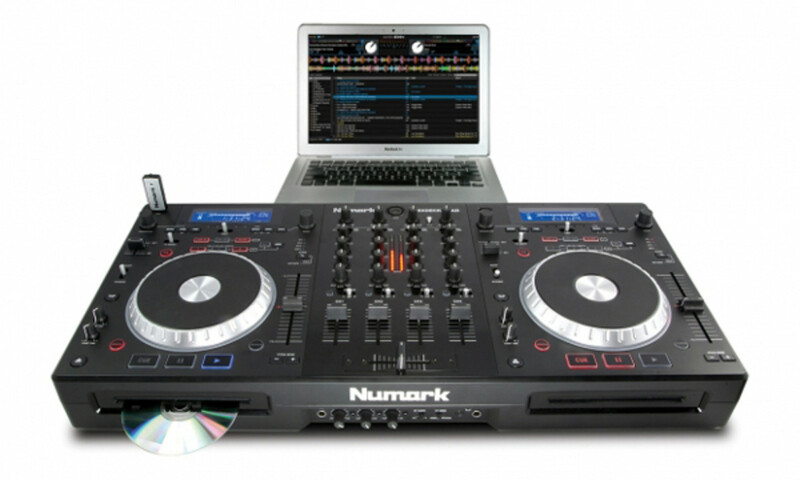 Numark has recently announced their newest DJ system called the Mixdeck Quad. This particular mixing system is super-diverse with the ability to play CD's, USB drives, iPad/iPod files, MP3's, and it has full MIDI support. The setup is basically a set of NDX-900 decks fused together with a mixing console in the middle that can all be controlled by a computer via DJ software or an iPad DJ system. Numark has recently sent us a brand new Numark Mixdeck for a full-in-depth-HD-Video review which will be out in about two weeks. For now, watch the unboxing video to see what you get in the box and my initial thoughts on this universal DJ system. The Numark Mixdeck was announced earlier this year at the NAMM show in California, but this time for the Musikmesse show in Germany, they have added two more decks of control to produce the all new Numark Mixdeck Quad Midi controller. This controller boasts, two CD Slots, USB hard drive slots, and USB connectivity for integration into your favorite DJ Software. Details and Press release inside.